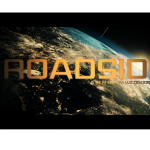 This week we held what I believe may have been the worlds first ever Virtual Reality screening with Q & A of a ‘festival’ film online, that film being my sci-fi short ‘Roadside’. There are many software reviews out there for various Oculus Rift Apps but I though it would be interesting to write about this particular experience from the perspective of a filmmaker. 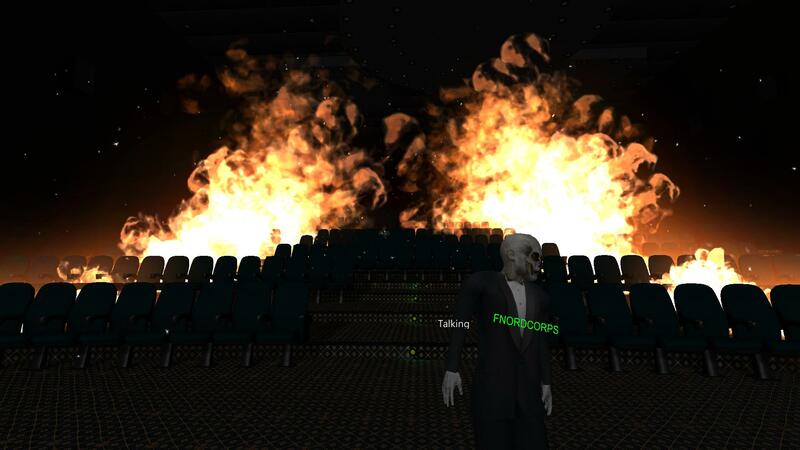 To explain, it was a screening held online, in a 3d rendered virtual theater with the avatars of attendees from many corners of the world in attendance. 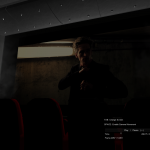 All watching the same movie – my movie, connected and synced by a wonderful piece of software called ‘RiftMax Theatre‘ – designed principally for use with the VR headset ‘Oculus Rift’. I have been a stalwart supporter of the Oculus since its original kickstarter campaign. I tinkered and played with the original Development Kit One, which as the title suggests was aimed principally at software developers. I invested, partially because I am a tech nerd and partially because I was thinking about its potential in filmmaking. To explain the experience you are wearing what looks on the outside like a pair of ski-goggles with lenses and screens inside, effectively placing you inside whatever 3d world/video you happen to have loaded up at the time. The image is in HD/stereoscopic 3d and your head movements are tracked with the image on the screens adjusted to match in real-time. Add a pair of headphones to that and you have an extremely immersive experience, in some cases, I believe, bordering on the profound. I was front of the (virtual) line for orders of the second development kit, also known as the DK2, now with a HD screen and positional head tracking – meaning your physical head position in the real world can now be translated directly and smoothly inside the virtual space. 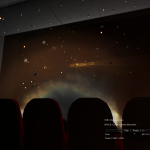 Last week I decided to try out Riftmax Theatre by Internow games. 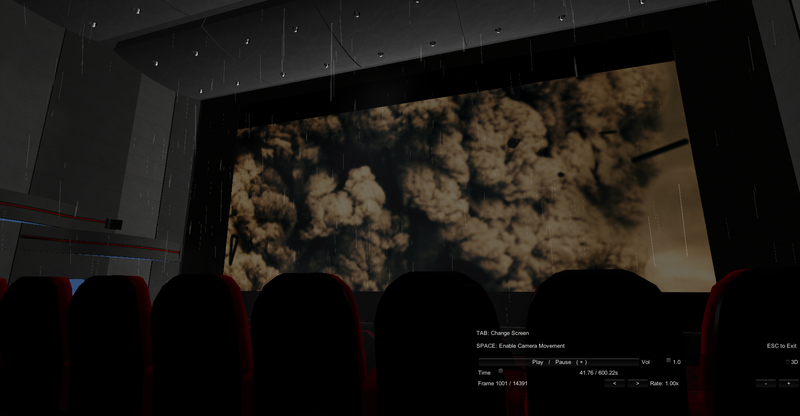 I loaded it up and was placed in the virtual lobby of a cinema complex, similar to what you would find in most towns and cities. 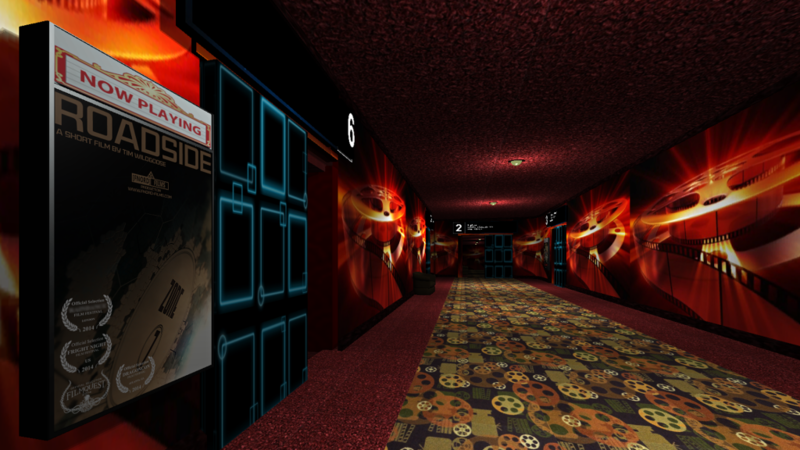 I could walk and look around the 3d rendered environment, explore the lobby and inspect the posters on the walls. I entered one of the theaters which are generally set up by other users. Anyone can set up their own theater and stream in any video footage they want, password protected or public. 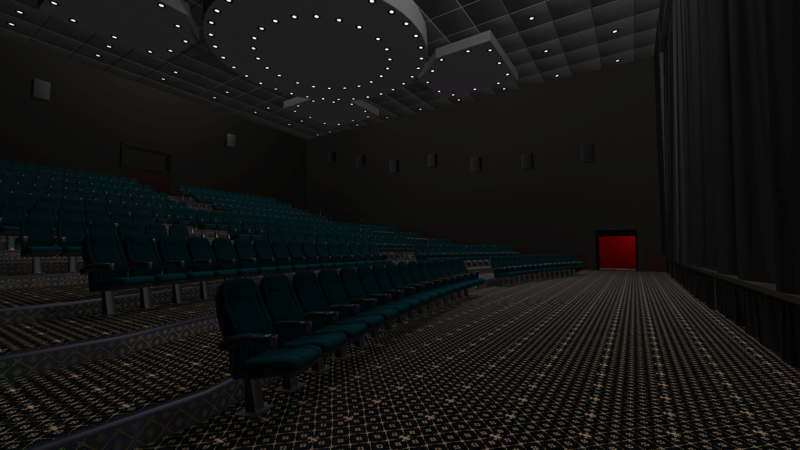 The theaters are essentially a 3d rendered screening room. Exactly as you would imagine any cinema in ‘real-life’ to look. As someone who has recently finished their short film, like most filmmakers the ultimate goal is to see that film shown large as life ‘on the big screen’. At the time of writing this I have yet to see ‘ROADSIDE’ on a ‘real-life’ screen any bigger than a large HD monitor. It has been screened in my absence at a couple of festivals in the US already, and won a prize. However, due to the expense of flying I have not been able to attend all the festivals I would like to – this is a common problem for many no/low budget filmmakers like myself. Using Riftmax and the Oculus I was able to watch my film at an immersive, perceived size and scale I had dreamed of when making my film. In fact on a bigger screen than usual. 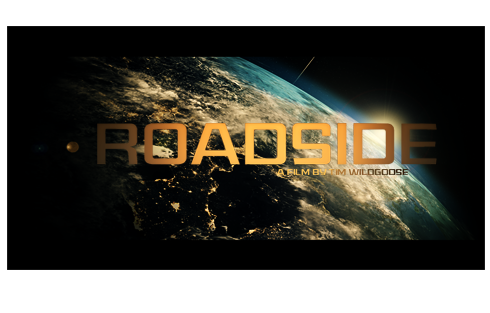 With thoughts of festivals fresh in my mind – ‘Roadside’ is currently doing the festival run. This gave me an idea. I contacted one of the development team of Riftmax Theatre – Caine, through Reddit and spoke to him about the possibility of using his theater to hold a festival-style screening of my film with an audience Q & A afterwards. I wanted his advice on how to proceed and make sure it worked smoothly. He and his team immediately jumped on board and started on the logisitics of making it happen. A few tests and technical logistic-sorting for the Riftmax team and we were ready to go a week later with the 4D – yes a ‘4D’ screening of the film. 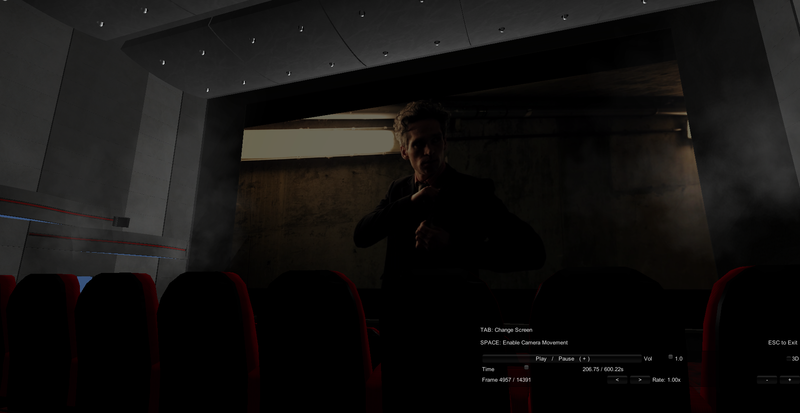 4D is a term that is thrown around a lot as a gimmick in some select theaters – wind effects, smell, water jets etc have all been tried out ‘In Real Life’. I personally don’t like them too much. 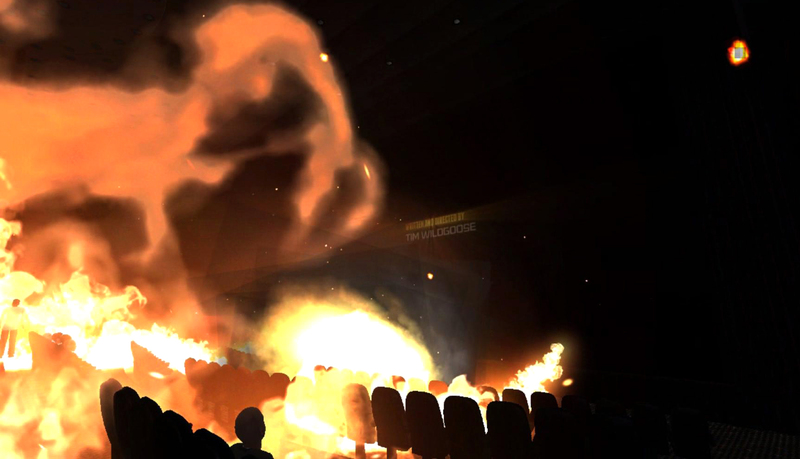 In Riftmax the 4D comes in the form of CG effects you can add to the theater area in the virtual world, surrounding you with all manor of effects, without any real-life limitations. As a filmmaker this added a whole layer of creativity for me and I spent a large portion of the prep-week, placing and testing the 4d effects to make sure they were subtle and tied in nicely to the film without distracting too much from what is happening on the screen. 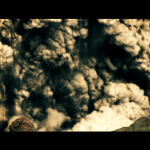 After playing around with RiftMax’s ‘Effects Generator’ software I quickly realized I was able to sync effects such as wind, rain, smoke, explosions fire etc to events happening in my movie, effectively spilling the film out and over the audience in a very immersive experience. 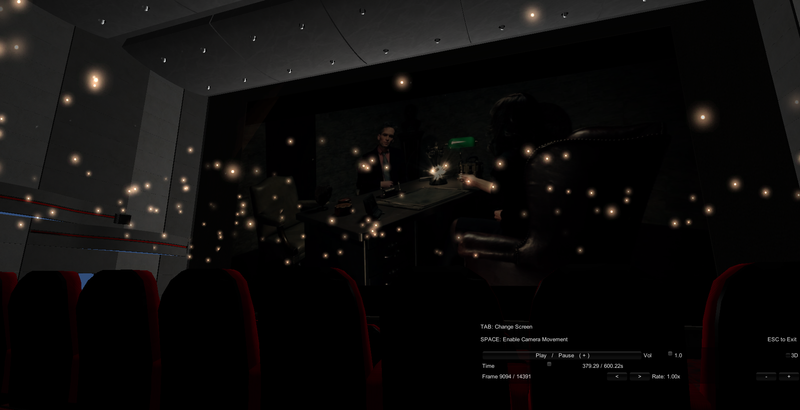 You can choose effects from the large library and position them within your virtual theater’s 3D space and choose to trigger them at chosen points during the film. It is hard to explain without actually ‘being there’ what it is like to have the rain ‘on-screen’ whilst simultaneously dripping on you within the virtual theater. 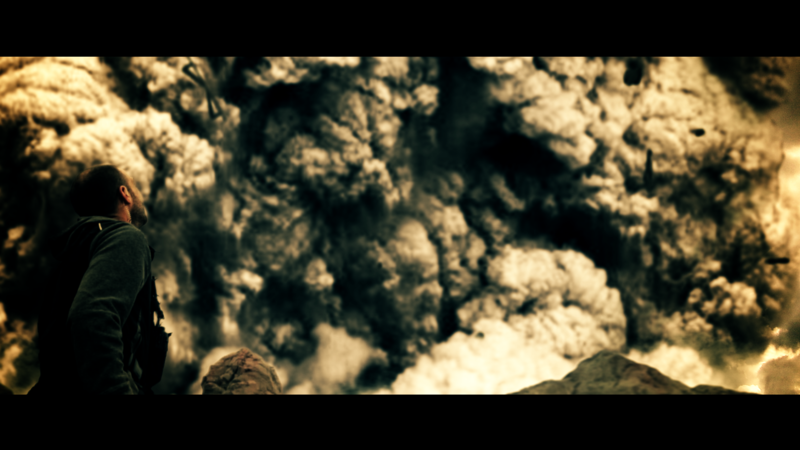 To have dust and debris fall on the audience as the debris falls on screen or to fill the theater with smoke clouds to match a particularly cloudy scene. All in glorious Sterescopic 3D, filling your entire vision. 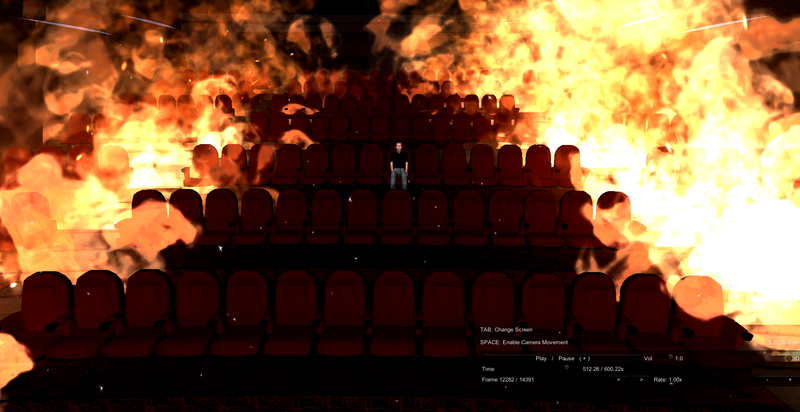 I also set my audience on fire as the grand finale. This all brings me to a bizarre immersion experience I have been experiencing on the Oculus that I wanted to take a moment to talk about. I am sure this will be written about in detail over the coming years and I am sure psychologists around the world are already testing the implications of this as I write. 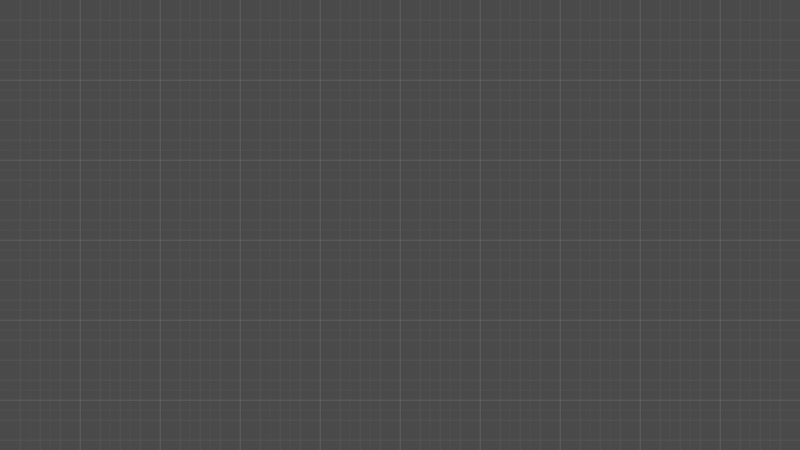 When you use a computer program or game you often view the experience on a flat 2d screen in front of you. 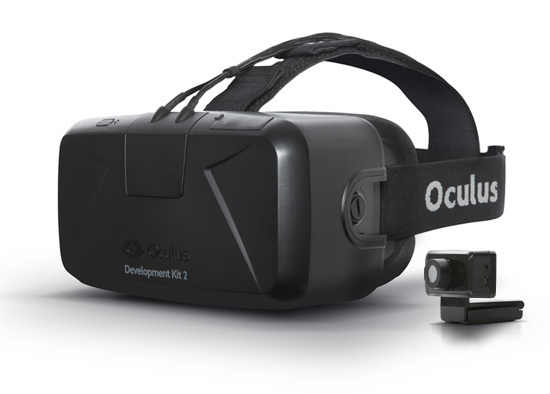 Oculus allows you to be inside and entirely surrounded by that experience. I have found increasingly that I now have memories of an event inside Oculus in the same way as though I had visited a place in real life. As in, I can visually/mentally remember the 3D space I was in at the time of witnessing the event, much like when you recall a memory of going to say, a museum and the layout of that museum. It is a fascinating phenomenom and helped add to the whole screening experience for me. I recall the event as though I was actually in a theater, watching my film with other people, which I was – sort of. On the actual evening of the first screening, we held two – a European GMT timed and North American MST timed events. I donned my avatar body, wearing a suit. 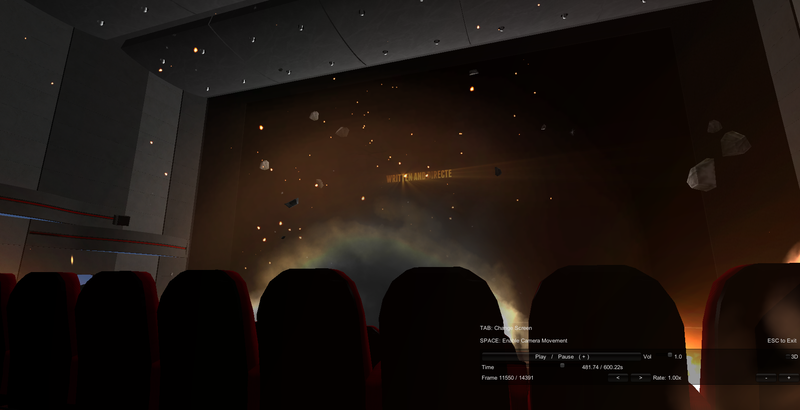 I arrived at the VR screening room early and took a seat. 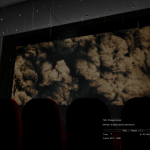 I sat at the edge of the theater and watched as one by one the various people who had requested passwords to the private event logged in (I wanted to protect my festival obligations by not releasing publicly online). 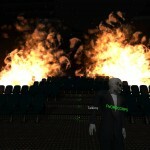 Their 3d avatars logged in and filed into the screening room, taking seats, some chatting to each other. Riftmax translates all head movement and lip syncs any speech to your avatar so the effect is quite surreal seeing very realistic head and mouth movements coming from 3d Avatars. Strangely I was pretty nervous, for all intents and purposes this was my first ‘big screen premiere’ of my film and I have never sat in with an audience while my film was playing. We were also streaming the event out to other Riftmax servers due to the popular response to the event so there were simultaneous screenings going on within Riftmax. After a couple of stalled starts (the software is in Beta) which did not seem to bother my audience, who are no doubt, like myself used to dealing with the Beta-technology of the Oculus Rift. 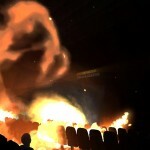 The movie started, synced to the audience around the world, 4D effects and all. The movie, and the 4D effects seemed to go down well. So much so that we watched the film a couple of times over, before I took to the podium again and answered questions from the audience. The questions came in via text and voice chat from all of the screening theaters, fielded by our host for the night – Caine. 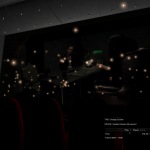 It blew my mind that I was talking to the audience, who were all spread around the world but had come together within this virtual room to talk about my film. It was a great experience and one that I would recommend to any filmmaker. I do firmly believe that when the consumer version of Oculus Rift is released and VR becomes accessible to the masses events like this will become a common occurrence. The potential for filmmakers to use this medium to get their film seen is massive, not to mention the opportunity to speak to their audiences without the financial limitations of travelling abroad. Riftmax can be found here and they have a kickstarter campaign starting soon so look out for it. My sincerest thanks to the Riftmax team – MikeArms / Caine / Bilago and everyone who attended for making one happy filmmaker. For anyone interested in seeing the 4D version of ‘ROADSIDE’ in Riftmax I do plan to release the film and the 4D file for everyone when the festival run is over. 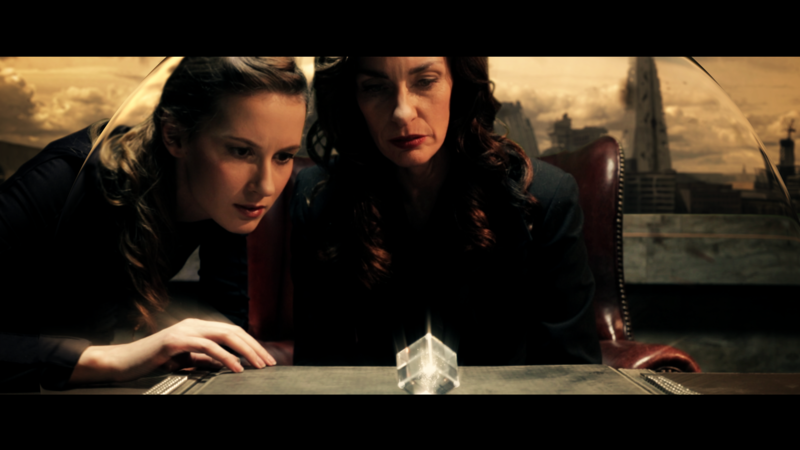 The film can also be seen on ‘the big screen’ at DragonCon Film festival, Atlanta this weekend. I will be attending this one In Real Life!